Red Hat Enterprise Linux 5 provides two mechanisms for sharing files and folders with other systems on a network. One approach is to use technology called Samba. Samba is based on Microsoft Windows Folder Sharing and allows RHEL 5 systems to make folders accessible to Windows systems, and also to access Windows based folder shares from RHEL. This approach can also be used to share folders between other Linux and UNIX based systems as long as they too have Samba support installed and configured. This is by far the most popular approach to sharing folders in heterogeneous network environments. The topic of folder sharing using Samba is covered in Sharing RHEL 5 Folders with Remote Windows Systems. Another option, which is targeted specifically at sharing folders between Linux and UNIX based systems, uses technology called Network File System (NFS). 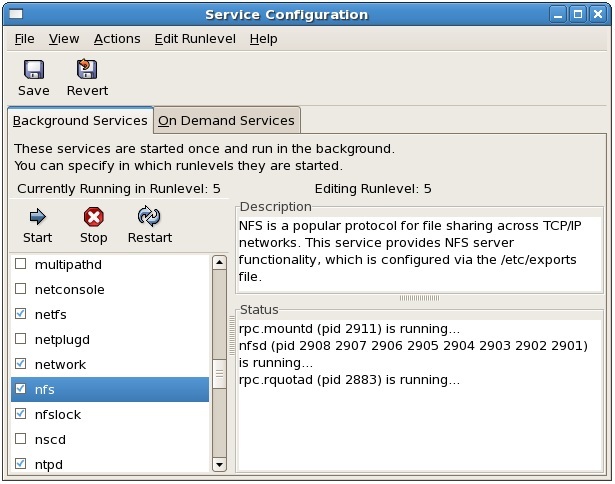 NFS allows the file system on one Linux computer to be accessed over a network connection by another Linux or UNIX system. NFS was originally developed by Sun Microsystems in the 1980s and remains the standard mechanism for sharing of remote Linux/UNIX file systems to this day. NFS is very different to the Windows SMB resource sharing technology used by Samba. In this chapter we will be looking at network based sharing of folders between RHEL and other UNIX/Linux based systems using NFS. 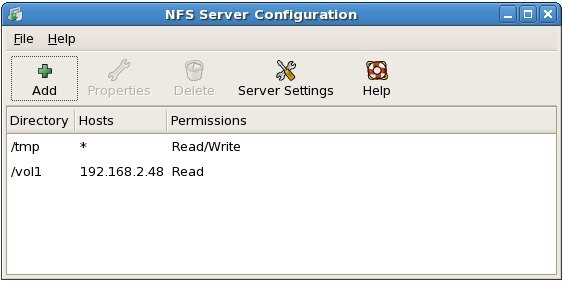 The first task is to verify that the NFS services are installed and running on your RHEL system. This can be achieved either from the command line, or using the graphical services tool. Next, the firewall needs to be configured to allow NFS traffic. To achieve this, run the Firewall Configuration tool by selecting the System -> Administration -> Security Level and Firewall menu option. If the firewall is enabled, make sure that the check box next to NFS4 is set and then click on Apply and OK.
Now that NFS is running and the firewall has been configured, we need to specify which parts of the RHEL file system may be accessed by remote Linux or UNIX systems. This can be achieved by directly editing files, or using the NFS Server Configuration GUI tool. In this section we will use the GUI tool to configure two folders to be shared, and then look at the system configuration file that was modified as an example of how to make these changes manually. In order to specify a folder to be exported for sharing via NFS to remote systems, click on the Add button in the toolbar. In the resulting Add NFS Share dialog enter the path to a directory you would like to share, either by typing in the path, or using the Browse button. For the purposes of this example select the /tmp directory. We are going to make the /tmp directory of the local system available to all hosts, so enter a '*' in the Hosts field and change the basic permissions to Read/Write so that remote users can both read and write to files on our system. Click on OK to save the settings. Repeat the above process to export a second directory of your choice, and this time specify the share as read only and allow only one host to access to the share by specifying the remote hostname or IP address. Next time the system reboots the /tmp folder located on the remote RHEL system will be mounted on the local /nfsmount mount point. All the files in the remote folder can then be accessed as if they reside on the local hard disk drive.